Jennifer Rees-Larcombe retells the story of Daniel and the lions. Daniel continues to pray to God, even in the face of King Darius' command. However, the lions refuse to eat Daniel, and Darius comes to believe that God was protecting him. 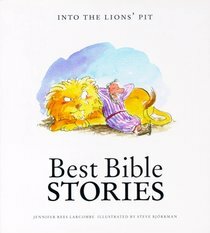 About "Into a Lion's Pit (Best Bible Stories Series)"
Jennifer Rees Larcombe runs a charity called Beauty from Ashes, which aims to help people facing loss and trauma. She has experienced several major losses herself, including the 'death' of a 30-year-old marriage. Jennifer has written many books and magazine articles, and is a regular contributor to Day by Day with God, Bible reading notes published jointly by BRF and Christina Press.